non-ionic surfactants – Norac Concepts Inc.
HASTEN ® NT ULTRA SPRAY ADJUVANT is an esterified vegetable oil based spray adjuvant. It is made from a unique blend of vegetable oil and non-ionic surfactants. It is an excellent penetrator as it modifies the waxy cuticle of the plant material which increases adsorption. Hasten NT Ultra reduces the surface tension of water droplets causing them to flatten or spread on the leaf surface so that the pesticide makes contact with weeds or other pests which provides the superior wetting and spreading benefits. The “NT” in Hasten NT meads NEW TECHNOLOGY. Consult product labels for use rates. 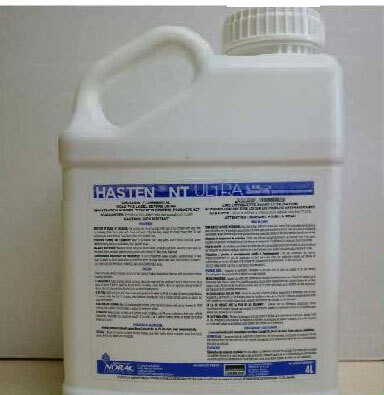 HASTEN NT ULTRA is available in 4×4 Litre case. Other package sizes available upon request. © 2017 Norac Concepts|Design by	Black Bike Media Inc.